The exchange of barbs took on exceptionally uncivil hues this time around. In the wild, rival mountain goats will engage in a ritual of head-butting to establish dominance. Politics in Kyrgyzstan operate on a similar principle. The end of the wearing battle of wills that has been going on for the past year between the former and current presidents looks no closer than it ever was. Speaking on March 17, the anniversary of the deadly Aksy clashes of 2002 between opposition protesters and government forces, both men took turns charging the other with verbal sallies. Controlling the messaging around commemorations for tragic political events in Kyrgyzstan is important on a symbolic level. The shameless exploitation is never especially dignified, however. In trademark unsubtle fashion, ex-President Almazbek Atambayev reminded an audience made up of his dwindling base of loyalists to recall that at the time of the Aksy incident, in which at least six people died, current President Sooronbai Jeenbekov was deputy speaker of parliament. Both Sooronbai Jeenbekov and his brother, Jusup, a provincial governor at the time, “sat quietly and did not say a word about those events,” Atambayev claimed. That was just for starters for Atambayev, who has been nurturing his recriminations ever since his protege, who took office in late 2017, impudently refused to allow the ex-president to continue effectively part-running the country from retirement. Jeenbekov evidently took the accusation to heart. In the months that followed, he began summarily removing Atambayev cronies from top government posts, and arresting some of them for good measure. “I apologize to everyone for bringing this person to power,” Atambayev said ruefully. 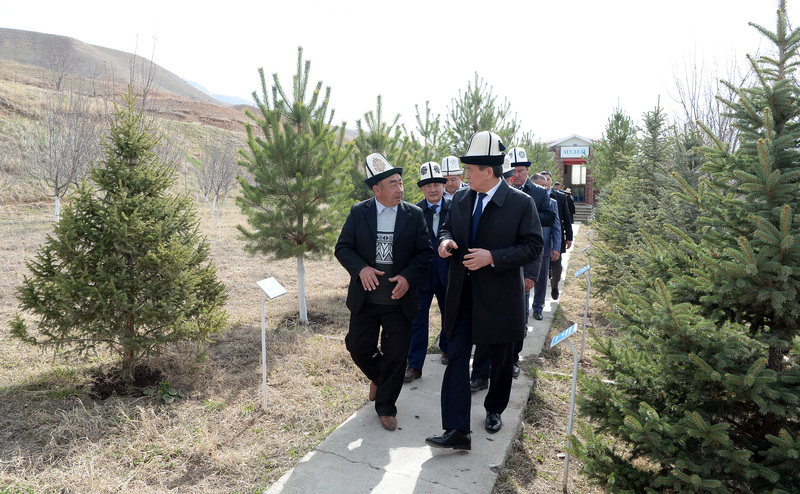 Over in Aksy, which is in southern Kyrgyzstan, Jeenbekov was presiding over an official commemoration ceremony and making digs of his own. Anticipating Atambayev’s now-habitual reference to family clans, Jeenbekov portrayed himself as a leading figure in the fight against this style of governance. Kyrgyzstan had also known rule by “organized criminal mafia,” he said. At least one prominent political commentator interpreted that as a reference to Atambayev’s reform-shy, petty authoritarian rule. If it was, it would be more than a bit disingenuous. Jeenbekov, after all, served as Atambayev’s chief of staff for a time, after which he was parachuted into the prime minister’s office. When Atambayev began casting his eye about for a handpicked successor – Kyrgyz leaders are constitutionally bound to a single, six-year term in office – Jeenbekov was the man he chose. Memories are short in politics. But Kyrgyz politics is gripped by full-blown cognitive dissonance, judging by the unfolding struggle over the country’s largest party. On March 18, following the fireworks at the weekend, Atambayev’s Social Democratic Party of Kyrgyzstan, or SDPK, announced it would now deem itself an opposition force. “We can offer alternative things. We are going to be openly critical of the government,” said party spokesman Kunduz Joldobayeva. That sounds about right. Atambayev has been ragging on Jeenbekov since this time last year. The only problem is that nobody is exactly sure what the SDPK — one of four parties in the governing coalition — even is anymore. Does it include, for instance, Jeenbekov’s brother, Asylbek Jeenbekov, who serves as fodder for many of Atambayev’s family-clan accusations and who entered parliament on an SDPK ticket? Formally, yes, although Atambayev has called on Jeenbekov to give up his parliamentary seat and has excluded another former friend and parliamentarian, Isa Omurkulov, who leads the SDPK parliamentary faction, from the party completely. Then again, the vast majority of SDPK lawmakers no longer recognize Atambayev as their leader. The upshot of all this is that the SDPK is holding two different party conferences at the beginning of next month. One will be led by Atambayev, while the other will be openly hostile to him. Correction: An earlier version of this article referred incorrectly to three planned SDPK conferences rather than two.